You can just tell by looking at this savvy baby shower cake that it is packed with personality! Such a hip cake design with its zebra-print ribbon and flower headband topper. And the touches of green give this diaper cake an eye-catching look. Very well done! Shannon is the creator of this cake, from the Keystone state of Pennsylvania! She is sharing her ideas, photos and diaper cake story with the rest of us because she is one of 'those' people. One of 'those' who pays it forward for others, like all of us who are looking for diaper cake ideas! Thanks to generous folks like Shannon, our diaper cake gallery is incredible! We ♥ our readers! Shannon, thanks a million for your stylish & suave diaper cake! Please share any and all of your diaper cake ideas with the rest of us! We have hundreds of readers each day looking for some inspiration to help them make a diaper cake...and YOU just might be able to help them. We would love to add your cake to our gallery! This was my very first diaper cake! I made the first two tiers out of Pampers size NB and the last tier out of Pampers size 1-2. The flower on the top is a hair clip that can be put on a crocheted headband for the baby. The woman who's baby shower it was for already had the bedset for the baby. 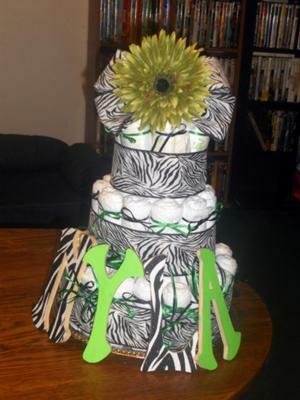 It was green with zebra print, so I made the diaper cake to match. The letters I also made for her to hang on the wall in the nursery as well. The shower hasn't happened yet, it is next weekend, but the grandma LOVED it! I can't wait to give it to the mom! That cake really looks nice love the design. This is the most lovely cake I have even. Cake with diapers and zebra design and ribbons that's a really great cake. This is a really different cake for the baby shower. The one who made it has put a lot of effort in it. By considering all the color combinations and name of the baby and everything. You have done a great job. Great article.